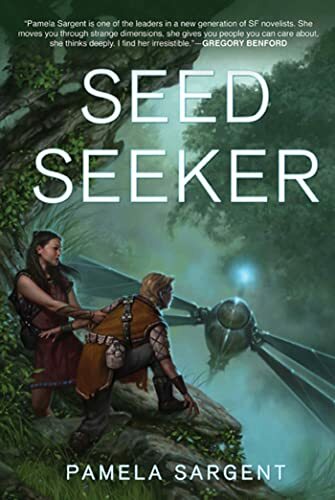 Pamela Sargent's Seed Seeker concludes a long journey which began in 1983 with her young adult novel Earthseed . It's the kind of novel often fleetingly remembered by those who encountered it as children in their school libraries—the plot, in its details, feels nearly surreal. In some far-future time, a spaceship (the appropriately named "Ship") prepares a group of children born from its genetic banks and raised without human parents to colonize a new planet far from Earth. As both test and training, Ship has the children (who bear internationally flavored names like "Zoheret" and "Ho") live within an artificial landscape called the Hollow, where the ground stretches upward to the sky and where they must face dangers both natural and human as strife and violence descend upon their little proto-colony. In this slim but undeniably dark volume Sargent both captivated teen audiences and teased them with suggestions of a sequel. But they had a long wait. It wasn't until 2007 that Sargent finally followed up with Farseed , the story of the extrasolar colony (on a planet named "Home"—Sargent's love for Capitalizing Important Words seems to know no bounds) that Ship leaves behind. Though on the surface it's quite different from the preceding volume, without the hard-for-YA techyness of Earthseed , Sargent remained committed to the same themes: warring factions, the violent and isolationist tendencies of humanity, and teen heroines who display grittiness, tenacity, and leadership potential that transcends even the normal standards of "strong female characters." Seed Seeker continues the trend of softening the series's hard SF roots, particularly through the novel's first half, to the point where one begins to wonder what, precisely, qualifies a series of three books to be labeled a trilogy. Each of the three novels in the so-called Seed Trilogy concern an entirely different generation of people, and by Seed Seeker we are, in fact, five generations beyond where we first began. The denizens of Home have split into two factions—the Dome Dwellers, who desperately cling to their identities as "true" and "pure" humanity, despite the fact that their settlement is clearly dying, and the River People, who have been undeniably changed by their time spent living and breeding in the alien wilderness. We begin our story with Bian, River Person and great-great-granddaughter to one of the villains of the first book. In fact, we first meet her as she sits with her great-grandmother, Nuy, one of the fierce heroines of the second novel, who has since become little more than a wrinkled, elderly crank, spouting stories about Ship's return and complaining that her descendants think she needs looking after. It's a compelling beginning, made even more exciting by the appearance of a new light in the sky—a light that very likely marks Ship's return to Home. Sadly, the pace becomes almost glacial through the novel's first half. We follow Bian as she travels out of her village for the first time toward the settlement of the Dome Dwellers, hoping that they've already contacted Ship using the ancient technology to which they've stubbornly clung. She journeys up the river with a friend, facing the elements and trading for supplies. Bian visits various people with names like "Vilia" and "Duman" and "Enli," thatches roofs in exchange for dried meat, and shares gossip about the whereabouts of those who live in her village. All of this is quaint, but not particularly interesting. Life on the mostly peaceful planet of Home is, in fact, quite a snooze, and our quest across it doesn't make for riveting reading. The tension is further diffused during chapters that explore life among the Dome Dwellers. There, we learn that the radio that could have been used to contact Ship has been destroyed. This makes Bian's optimistic journey toward the settlement, not to mention the endless speculation during her travel of the River People about Ship's return, fairly maddening. And so Ship's obvious return—really, no other possibilities are raised or even suggested—makes mankind's complete inability to actually engage with it profoundly frustrating. It's as if God appeared in human form in Times Square, but insisted on communicating through a series of hypersonic whistles and infrared writing. Eventually, Ship does make contact, and it's then, in the second half of Seed Seeker , that the story begins to build momentum. Bian and Ship begin tentative communications, and in their conversations the true unifying element of the trilogy becomes apparent. This is not a trilogy because it has some continuity in its human characters or themes (though it does). Rather, the Seed Trilogy is truly the story of Ship itself, an artificial intelligence with a wholly human and entirely engaging arc of growth. When we first meet Ship in Earthseed , it believes wholeheartedly in its mission to seed the remnants of humanity through the stars. It acts as both parent and teacher to its young charges, but in those roles it makes executive decisions that are sometimes ethically hazy, hiding key information from Zoheret and her friends. It's difficult to fault a machine for these missteps—it's acting according to its programming, after all. But by the end of the first book, Ship is aware of its own free will and capacity for decision making, and, by the second book, seems existentially adrift. This adds a layer of surprising complexity to the Seed Trilogy. Ship is a god, sure—it set the settlers down on Home, then left just when they needed it most. The settlers fear Ship's judgment and worry whether they're living according to Ship's original designs for them, and once Ship returns, they fear that they'll once again be abandoned by their creator. And at times, Ship's approach to the settlers is both goddishly paternalistic and, to them, confounding. Sometimes Ship tells them what to do; sometimes Ship saves them. But sometimes Ship refuses to answer their very simple questions, too. But Ship is also surprisingly human, sympathetic particularly in its confusion of purpose after it leaves the colony at the end of the first novel. Ship entertains the idea of several new missions: to seed other planets, to become a planet itself, to stay in orbit around Home and watch over the colonists, to return to the Sol System to find other lifeforms like it. Though we don't directly experience Ship's adventures away from Home, the small bits of internal narration we're privileged to suggest that these are lonely sojourns. It's difficult to read such poignant passages rendered in Ship's own voice at the conclusion of each of the three novels and not want to embrace the (supposedly) unfeeling metal creature as one would a kid just on the cusp of adulthood. But then, as Ship reminds us at the conclusion of Earthseed , "I, too, am no longer a child" (p. 282). In this way, the Seed Trilogy presents a much more complex coming-of-age story than that contained within any of its individual volumes. Hidden behind three smaller stories of political strife and warring colonists is sweeping, thought-provoking science fiction about how technology holds the capacity to make gods out of men, and children out of gods. It's not simply a bildungsroman of our human heroes, but instead the story of how the fruits of human science might one day stumble—with an adolescent awkwardness and with clumsy charm—toward adulthood, too.